Known as Aaron to his father, Jean-Marie to Pope John Paul II and Monsignor Bulldozer to his old parishioners, while the rabbis in his native France call him a Christian, as a Jewish born child who was baptized after converting to Catholicism as a young teen to escape the fate of relatives who died at Auschwitz, Jean-Marie Lustiger considers himself a Catholic Jew. 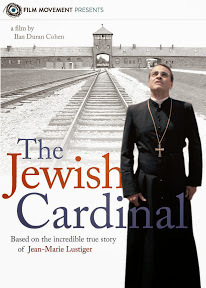 While many consider that complicated at best and a contradiction at worst, in this powerful biopic from French filmmaker Ilan Duran Cohen, we’re given an extraordinary multilayered and largely objective account of the life of the controversial Jewish cardinal. 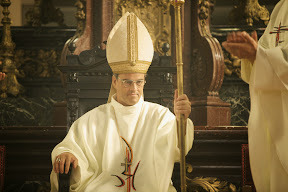 Quickly rising in the ranks to become one of the closest confidants of the pope (whom he simply calls Karol), Jean-Marie never seems divided in the slightest by his so-called dual identity or allegiance to one religion or another until he finds himself at a crossroads of his past and present. When a group of Carmelite nuns set up a convent at Auschwitz, renovating the very building where his mother was murdered by the gas that was stored in the very room they’re occupying, Jean-Marie is faced with a crisis of conscience, culture and identity while confronting the role that both faiths play in his life. Though the dual faiths had never dueled before (at least in his eyes), Jean-Marie soon finds himself in a religious standoff. Sent to intervene and help mediate an agreement with Polish church leaders and representatives from the Jewish community alike, when politics soon come into play (as the pope is pushed to intervene and pull rank on his own country), Jean-Marie begins questioning not only his own identity but just how and why he was promoted so quickly by Karol. Facing concerns and charges of hypocrisy leveled directly at him and by him at both communities, Jean-Marie goes through a major existential upheaval while taking inventory of the faiths and facts that guide his spiritual journey. A terrific film that serves as a great double feature to Film Movement’s previous tale of a Catholic priest in crisis – In the Name Of – the helmer’s approach to The Jewish Cardinal is as journalistic as it is elegantly ornate. Though lusciously photographed – with the obvious and understandable exception of the nuns and their cohorts at Auschwitz that took to pouring water on the heads of Jewish protesters – Cohen’s ability to keep an open mind and avoid imposing any kind of overt message or paint either religious group in a dominant, negative light is admirable indeed. 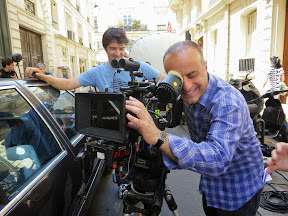 Admittedly, while the filmmaker presents everything with a cool, level head, I found myself torn by my initial reaction to our lead – not liking the often unsympathetic man who’d rejected his background and broken his father’s heart while at the same time finding myself admiring his dedication to following his own path regardless of which text had inspired him along the way. However, the film deepens as it continues as we begin to learn more about our protagonist including what happened on a life-changing student exchange trip (that has haunted him for decades) which makes Cohen’s work that much more engrossing. While given the contemplative nature of his profession, we’re left to deduce a great deal of Jean-Marie's rationale behind certain actions that may have been better conveyed by giving the cardinal someone to bounce more thoughts off of via a confidante of his own, all in all, it’s still a thoroughly riveting feature that stays with you long after it’s over. In fact I couldn’t stop thinking about the movie as well as the man for days (namely the telling yet troubling decision to have prayers of two faiths said at his grave after denying his father the same courtesy). One of those unfailingly humanistic features, the film puts reality above any desire to manipulate viewers into sympathizing 100% with its characters by instead daring to show us a flawed human being that plays his cards close to his prayer robes. 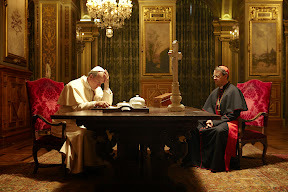 As such, Cardinal is as strengthened as it is occasionally weakened by its adherence to “just the facts” rather than serving up a more dramatic interpretation of the events that shaped our subject's life. Yet regardless of which Jean-Marie Lustiger we happen to encounter at different points in the film, the conflicted cardinal who (depending on the situation) was as soft spoken as he was prone to temper-ridden bulldozing is brought vivaciously to life by the stellar, convincing portrayal of With a Friend Like Harry actor Laurent Lucas. A man whose identity meant something different to everyone, Lustiger is perhaps best understood as an enigmatic, flawed and ultimately ambiguous man. Yet even though his goal to be all of the above may have found him having to pick sides from time-to-time, thanks to Cohen’s compelling film we’re at least able to appreciate Jean-Marie Lustiger’s noble quest to remain faithful to his true self above all.